Children’s Healthcare of Atlanta (“CHOA”) provides free access to certain materials and information, documentation, forms, questionnaires and diagrams relating to the study, prevention, and treatment of concussions via this website and its related pages, including without limitation, for your reference or download (collectively, the “Concussion Program Materials”) as described in this License agreement (“Agreement”). By accessing the Concussion Program Materials, you accept and agree to the terms and conditions of this Agreement. (iii)	if you are a healthcare provider, you may use the Concussion Program Materials for your personal, professional development to enhance your medical knowledge in the field of concussions. You acknowledge the Concussion Program Materials are not to be used as definitive diagnostic tools with any specific patient and your independent medical judgment will be used to treat any patient. You must maintain all CHOA proprietary notices on the Concussion Program Materials. You may not copy, modify, adapt, reverse engineer or create derivative works of the Concussion Program Materials or remove any copyright or other proprietary rights notices therefrom. Notwithstanding the foregoing, where indicated in the Concussion Program Materials, schools and sports organizations are permitted to co-brand certain of the Concussion Program Materials with CHOA’s prior written consent. Additionally, schools, sports programs and recreational leagues may put their own logo on the Concussion Policy and modify it to meet their needs. CHOA may update, replace or remove some or all of the Concussion Program Materials from time to time, and you should check back with the website to determine if the Concussion Program Materials you downloaded are current. 2. Reservation of Rights. Except for the limited license provided to you in Section 1 of this Agreement, no express or implied license, right, or ownership interest of any kind is granted to you with respect to any of the Concussion Program Materials or any copyrights, trademarks, or other intellectual property rights therein. CHOA reserves all rights not expressly granted in this Agreement. 3. Disclaimer of Medical Advice. The Concussion Program Materials do not constitute specific medical advice and are provided as information resources only. The Concussion Program Materials do not create a patient-physician relationship and should not be used as a substitute for professional advice and treatment from a licensed doctor. In the case of a concern, a medical professional should be consulted. In the event of an emergency, you should call 911 or go to the nearest emergency department immediately. By licensing the Concussion Program Materials, CHOA is not assuming any duty to update the Concussion Program Materials, and you are responsible for reviewing and approving the Concussion Program Materials for your use. 4. No Warranties. While CHOA makes efforts to provide materials that accurately reflect the research and information CHOA is authorized to make available publicly, THE CONCUSSION PROGRAM AND ALL RELATED MATERIALS ARE MADE AVAILABLE TO YOU ON AN “AS IS” BASIS AND CHOA DISCLAIMS ANY AND ALL WARRANTIES, WHETHER EXPRESS OR IMPLIED, INCLUDING, WITHOUT LIMITATION ANY WARRANTIES OF MERCHANTABILITY, FITNESS FOR A PARTICULAR PURPOSE, TITLE, AND NON-INFRINGEMENT. 5. Limitation of Liability. IN NO EVENT WILL CHOA OR ITS AFFILIATES, OR ANY OF THE OFFICERS, DIRECTORS, SHAREHOLDERS, EMPLOYEES, AGENTS OR REPRESENTATIVES OF CHOA OR ITS AFFILIATES, BE LIABLE TO YOU FOR ANY INDIRECT, SPECIAL, INCIDENTAL, EXEMPLARY, OR CONSEQUENTIAL DAMAGES OR LOSS OF GOODWILL OR PROFIT IN ANY WAY ARISING FROM OR RELATING TO THIS AGREEMENT OR THE MATERIALS, HEREUNDER, INCLUDING THE FAILURE OF ESSENTIAL PURPOSE, EVEN IF NOTIFIED OF THE POSSIBILITY OR LIKELIHOOD OF SUCH DAMAGES. IN ANY EVENT, THE LIABILITY OF CHOA AND ITS AFFILIATES, AND THE OFFICERS, DIRECTORS, SHAREHOLDERS, EMPLOYEES, AGENTS AND REPRESENTATIVES OF CHOA AND ITS AFFILIATES, FOR ANY DAMAGES WHATSOEVER, SHALL NOT EXCEED ONE HUNDRED DOLLARS. 6. Governing Law. This Agreement shall be construed and governed in accordance with the laws of the State of Georgia of the United States of America, without regard to its rules regarding conflicts of law. 7. General. This Agreement constitutes the entire agreement between the parties regarding its subject matter and supersedes any prior understanding or agreement respecting the subject matter of this Agreement. You irrevocably waive any and all right to trial by jury in any legal proceeding arising out of or relating to this Agreement or Concussion Program Materials. If any provision of this Agreement is held invalid, the remainder of this Agreement will continue in full force and effect. Genetic disorders can be challenging to diagnose and manage. Our genetics team works with Emory University School of Medicine to identify these disorders as early as possible so that you have the information and support you need. TS (or TSC) is caused by defects (called mutations) on one or both of two genes: TSC1 and TSC2. TS causes benign tumors to grow in the brain and on other vital organs, such as the kidneys, heart, eyes, lungs and skin. It usually affects the central nervous system. Symptoms can include seizures, developmental delay, behavioral problems, skin abnormalities and kidney disease. TS was once called epiloia or Bourneville's disease. NF refers to genetic disorders that cause tumors to grow in the nervous system—on nerves and, less frequently, in the brain and spinal cord. NF can cause skin changes, bone deformities and other health issues. Although it can be inherited, up to half of new cases arise through mutation (change) in a person’s genes. Once this change has taken place, the gene can be passed on to future generations. NF1 is the more common type. Symptoms may be evident at birth and nearly always by the time the child is 10 years old. They can include light brown spots on the skin (cafe-au-lait spots), growths on the iris of the eye, a tumor on the optic nerve, a large head circumference, and abnormal development of the spine, a skull bone or the tibia (shinbone). NF2 is less common and is characterized by slow-growing tumors on the right and left eighth cranial nerves. The growths are called vestibular schwannomas or acoustic neuromas. The tumors press on and damage nearby nerves and reduce hearing. Schwannomatosis is the development of multiple schwannomas (tumors made up of certain cells) throughout the body except on the vestibular branch of the eighth cranial nerve. Pain develops as a schwannoma grows and compresses nerves or adjacent tissue. Other symptoms can include numbness, tingling, or weakness in the fingers and toes. Lipid storage diseases, or the lipidoses, are metabolic disorders inherited from one or both parents who carry a certain defective gene. This gene regulates a protein in a class of the body’s cells. These diseases cause harmful amounts of fatty materials (lipids) to gather in various cells and tissues in the body. Over time, this excessive storage of fats can cause permanent cellular and tissue damage, particularly in the brain, peripheral nervous system, liver, spleen and bone marrow. Inherited metabolic disorders are genetic conditions resulting in problems metabolism, the chemical reactions that convert food to energy and building blocks for protein and other substances. These disorders are usually caused by a defective gene that results in an enzyme deficiency. They can range from life-threatening disease to conditions that can cause muscle damage and other less severe symptoms. Some examples of metabolic disorders include Tay-Sachs disease, phenylketonuria and glycogen storage diseases. Single gene defects are caused by mutations in one gene. They can be passed down, or can appear for the first time in the sperm or egg. Sickle cell is one example of a single gene disorder. Multifactorial inheritance means that many factors contribute to an inherited health problem. The factors are usually both genetic and environmental. A combination of genes from both parents, in addition to unknown environmental factors, can work together to cause certain conditions. Neural tube defects and hip dysplasia are two examples of multifactorial conditions. A teratogen is any agent, such as a drug or an illness, that can interfere with the development of an embryo and lead to birth defects. One well-known teratogen is alcohol, which is why drinking any alcohol during pregnancy is dangerous. Inheritance patterns that are not chromosomal, single gene or multifactorial are referred to as nontraditional inheritance patterns. Some examples of nontraditional inheritance patterns include Prader-Will syndrome, Angelman syndrome and Leber’s optic atrophy. Our geneticists offer testing for the full range of genetic disorders, from before birth to early adulthood. We can refer to other Children’s specialists to ensure your child gets care that meets all his needs, and to help you and your family cope with any related challenges. Diagnostic testing is used to identify or confirm the diagnosis of a disease or condition, in most cases providing a definite “yes or no” answer. It is sometimes helpful in determining the course of a disease and next steps. Predictive genetic testing determines the chances that a healthy person might develop a certain disease. Predictive testing is available for some diseases that may not show up until adulthood, such as some types of cancer, cardiovascular disease and some single gene disorders. Presymptomatic genetic testing determines whether a person with no symptoms, but with a family history of a disease, has the genes associated with the disease. Carrier testing can determine whether a person carries a copy of an altered gene for a particular disease. The disease may be autosomal recessive, which means a person has the disease only if two copies of the altered gene are inherited. Couples who both carry the same autosomal recessive gene have a 25 percent chance (with each pregnancy) of having a child with that disease. A recessive disease may also be X-linked recessive, which means the altered gene is located on the X chromosome. Since females have two X chromosomes, girls and women can be carriers of a gene on the X chromosome but can be unaffected. Their children could still be at risk. If a man has the altered gene on his X chromosome and does not have the normal copy of the gene on the Y chromosome, then he is usually affected with the disease. Carrier testing for X chromosome-linked conditions is usually done only in females. Prenatal diagnosis is used to identify a genetic disease or condition before a baby is born. Prenatal testing can include maternal serum screening, ultrasound (sonograms), amniocentesis, chorionic villus sampling (CVS) and percutaneous umbilical blood sampling (PUBS). Preimplantation studies are used after an in vitro fertilization to check for a genetic disease or condition in an embryo before it’s implanted into the mother's uterus. Newborn screening can detect certain genetic diseases so that treatment and management can begin as soon as possible. Physicians from many specialties care for patients with genetic diseases. As we learn more about these complex disorders, ophthalmologists, neurologists, endocrinologists, craniofacial surgeons, cardiologists and rheumatologists are becoming more knowledgeable about genetic diseases and considering their possibility more often. These doctors refer patients to our Children’s Genetics team for diagnosis and other services. Your child will most likely be seen first in one of our general genetics clinics. If diagnosed with a specific disorder, he may then be referred to a multidisciplinary clinic focusing on that disorder. For example, we have clinics for metabolic disorders, neurofibromatosis, Down syndrome, fragile X and lysosomal storage disease. 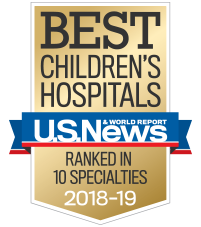 ©2019 Children's Healthcare of Atlanta Inc. All Rights Reserved.